Taza to Go is a ready-to-drink chocolate extravagance from Valor, the renowned Spanish chocolatier founded in 1881. The name comes from getting chocolate “a la taza” in Spain, which means in a small white ceramic cup. It’s an amazing, thick, rich dark chocolate drink served hot. I would call it hot chocolate, but that’s like calling the Casa MilÃ in Barcelona an apartment. It’s only hot chocolate in the sense that it’s chocolate, which is hot. It’s more like a melted dark chocolate bar with just enough milk added to make it into a thick, drinkable liquid. It’s especially popular at breakfast, but also as a dessert treat. Okay, great, but what will it taste like when it comes, not from a freshly melted chocolate bar and milk from your master chocolate barista, but from a premixed, imported pouch? Extremely delicious, if properly prepared. As I sit down with my third cup of Taza to Go, I’m struck by how making this the right way really pays dividends. Let me explain. When you first open the pouch and pour this dark goodness out, it looks more or less like pudding. Of course I took a spoonful. It was good, but not crazy good. The chocolate side of it was fine, but the reconstituted milk was a little weird. Since it was so thick, I then decided that I should add enough milk to make it like regular hot chocolate. I did that. It was very good hot chocolate, but something was still a little off. So, finally, I took the pouch directions seriously and simply heated up the thick pudding. Specifically, I put three tablespoons in a small-ish coffee mug (Ikea 365+, you know the one) and heated it for 25 seconds. Removing the mug, I saw that the chocolate had risen about 3/4 of the way up, so 35 seconds probably would have made a molten lava mess. Twenty-five seconds (1000 watt oven) was perfect. The heat had liquefied the Taza to Go, and I gave it a stir. Time for a sip of this premier drinking chocolate, as it’s intended to be enjoyed. Wow. Now we’re talking. And sipping. Then slurping, then licking of mug. Then making of another mug. This is a wonderful treat. It’s a very strong chocolate flavor, but smooth and with several flavor notes to keep things interesting. There’s also a tinge of cinnamon. 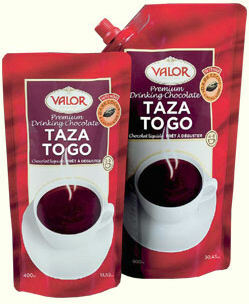 You can really taste the quality of Valor chocolate in this Taza to Go super drink. So, you may not be used to drinking hot chocolate like this – very thick, and very rich. But once you try it, it’s good times all around. It’s like the bottom of the mug in normal hot chocolate where the chocolate has settled. Except this is nothing but thick and rich, and it’s got just an exceptional chocolate taste – not that junky flavor you get from low cacao content, cheap fillers, or corn syrup. Although a bit pricey ($12 for 900 ML/30.43 oz), this big pouch makes many delicious, concentrated servings. I highly recommend this fantastic chocolate drink, especially as fall leaves begin to fly. Wow, nice. If I can find it in one of our local stores I may definitely be trying this in the near future.